I slightly altered the recipe for simplicity. It was absolutely delicious and I already can’t wait for lunch tomorrow to have more. 1. 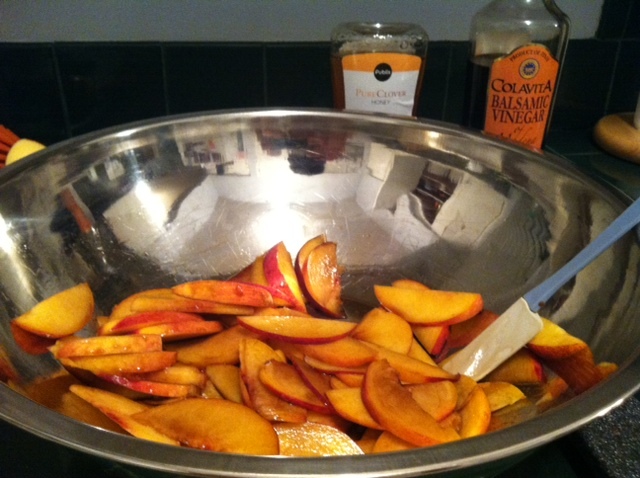 In a medium mixing bowl, combine 1 tablespoon each honey and vinegar with a fork; add peaches and stir to coat. 2. 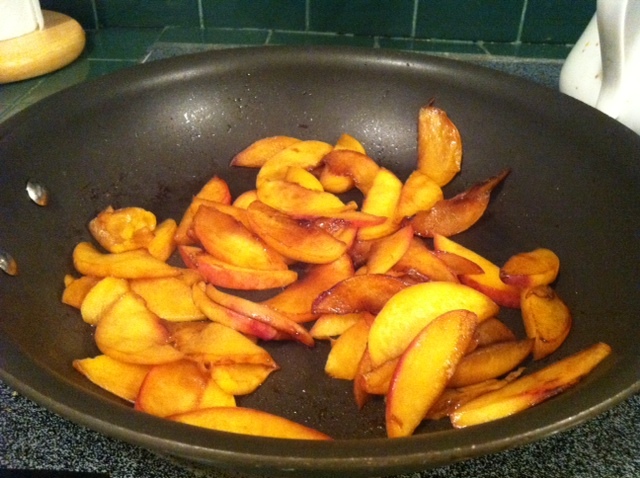 In a large nonstick pan, sear peaches over medium heat for about 3 minutes per side or until caramelized. Remove from heat and let cool. 3. While waiting for peaches to cool, whisk together yogurt, lemon juice, mustard, and remaining honey and vinegar in a medium bowl. Drizzle in oil, whisking constantly; season with salt and pepper. 4. Divide spring salad mix among four plates. 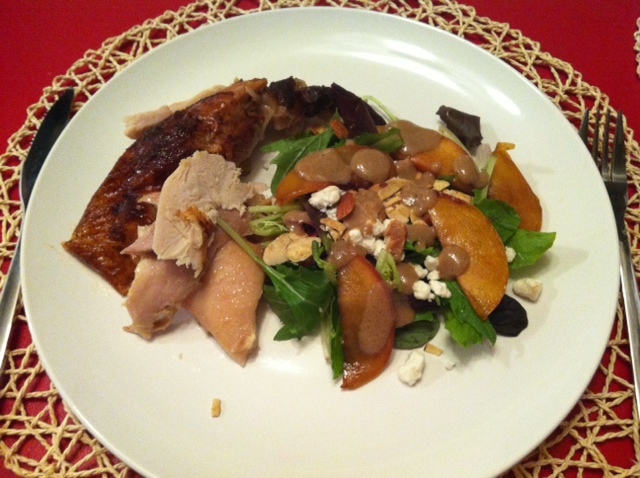 Top with goat cheese, sliced almonds, balsamic peaches and a drizzle of the dressing. I paired my salad with some Publix rotisserie chicken (my favorite flavor: mojo). My dinner was absolutely delicious. The sweetness of the peaches combined with the balsamic and honey mixture was a pleasant surprise and the goat cheese wasn’t overpowering. 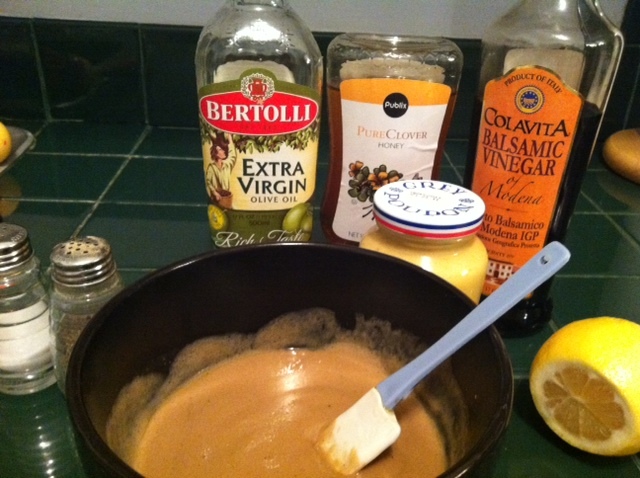 I wasn’t sure how I would feel about this salad dressing, but I think I’ll be making it on a regular basis! When I texted my sister about my delicious salad, she responded with the following text: “Eww. I don’t like fruit in my salad.” I don’t blame her… I can’t stand mandarins in any salad, but this is worth trying. Do you like any fruit in your salads? Which ones? I’m not the best cook. But on the bright side, I’m also not the worst cook. I border somewhere between lazy and uninspired. 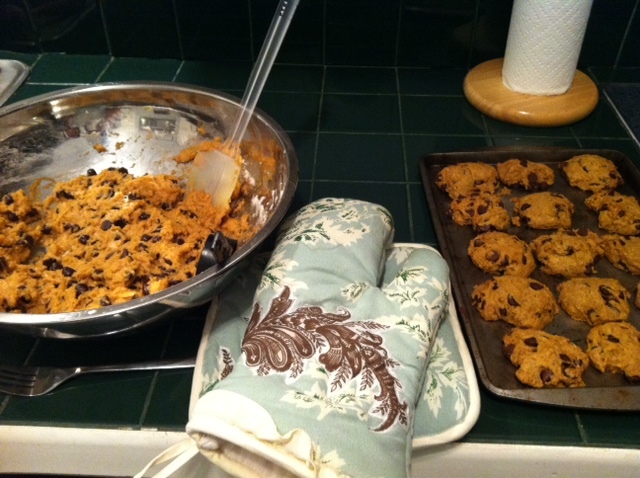 The lazy part is particularly why I absolutely love easy recipes. Easy is something I can do. 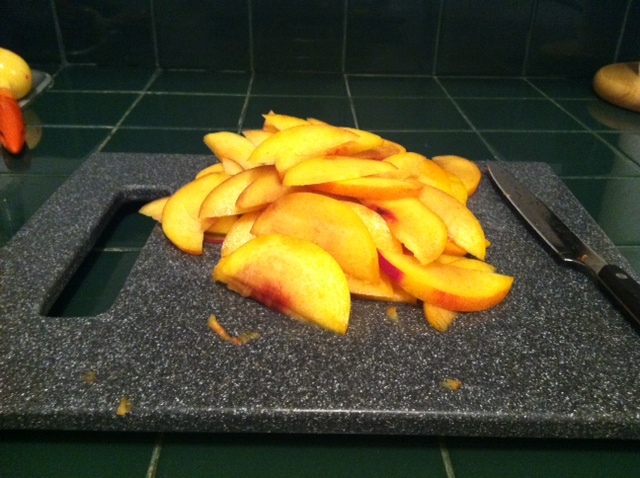 While reading one of my favorite local blogs, Meals and Miles, I found this recipe on how to spice up a frozen pizza. Runny eggs used to disgust me, but after four years of watching my boyfriend soak up his yolk with everything on his plate I finally gave in and gave it another go. And I grew to actually crave it. Who am I?? Sprucing up my Archer Farms Mediterranean pizza seemed simple enough. I added bacon, fresh mushrooms, mozzarella (in my opinion pizza can never be too cheesy) and halfway through the baking time I added three eggs as suggested. 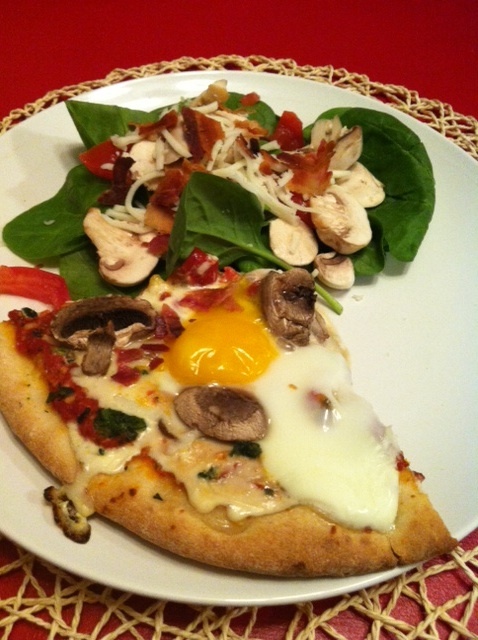 I paired it with a spinach salad with mushrooms, bacon and mozzarella. I like buying spinach because (a) it’s good for you, and (b) you can always use it to make a salad or sauté with salt, pepper and a little parmesan cheese for a yummy side. I hadn’t decided on what type of dressing when I took this pic, but I settled on good ol’ light ranch. 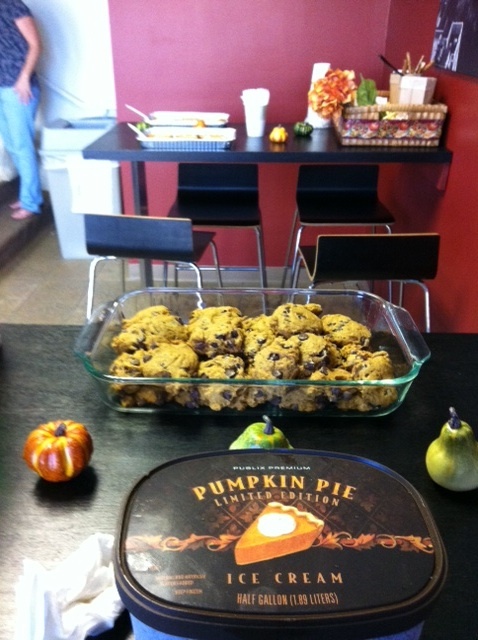 That certainly wasn’t the healthiest option, but it did make me oh so happy! 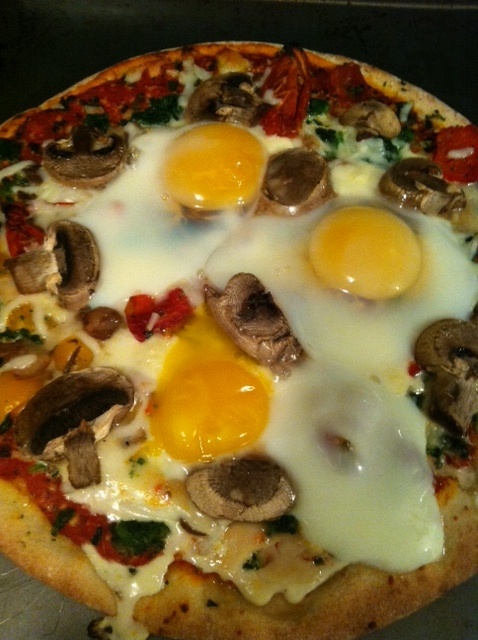 If you’re not a big yolk fan, this might not be for you, but if you are, I strongly suggest sprucing up your frozen pizza with eggs. Have you ever added anything unusual to spice up your frozen pizza?